Suffer from bad breath? Dr. Baker is here to help. Bad breath can be embarrassing. It can get in the way of our professional and social lives. If you suffer from bad breath, you are not alone. Brush and floss more frequently. The prime cause of bad breath is plaque. It will build up on your teeth and in between teeth, making an ideal place for bacteria to grow. Brush at least twice a day, and floss at least once a day to prevent the buildup of plaque. Scrape your tongue. The coating that forms on your tongue can contain foul smelling bacteria. You can brush your tongue with a toothbrush or use a tongue scraper to clean it. Avoid foods that sour your breath. Foods like onions and garlic are the worst offenders. They can make their way into your bloodstream and to your lungs where you breathe them out. It is best to avoid these foods before events when you want to be sure your breath is fresh. Kick the habit. Smoking will no doubt cause bad breath, as well as other oral health problems. You’ll notice a huge difference after you quit. Rinse your mouth. Using mouthwash will freshen your breath and help get rid of bacteria in your mouth. If you don’t have mouthwash handy, simply rinse with water after eating to remove food particles. Chew gum instead of mints. Sugary mints will only promote bacteria growth in the mouth. Gum (especially sugarless) stimulates saliva production, which is a natural defense against bacteria. Keep your gums healthy. Gum disease is a common cause of bad breath. Regular brushing and flossing will prevent gum disease and keep them healthy. Be aware of dry mouth. Lack of saliva promotes tooth decay and bad breath. If your mouth is feeling dry, drink some water or chew sugarless gum (or mints). Be sure to tell your dentist if you are experiencing persistent dry mouth. See your dentist. If your bad breath continues be sure to see your dentist. It could be a symptom of a medical condition such as a sinus infection, lung infection, liver or kidney disease. Brush twice a day and floss daily. Brushing your teeth twice a day fights plaque and decay. Flossing gets rid of food particles trapped between your teeth and gums that a toothbrush just can’t reach. Use mouthwash. A daily rinse with antiseptic mouthwash will help kill germs and bacteria that you can’t reach with a toothbrush. Mouthwash will also freshen your breath and fight plaque. Drink more water. At least eight, 8-ounce glasses of water a day is the recommendation. If you are drinking water, you are less likely to drink cola, tea and coffee, which can stain your teeth. Use protective devices. Wear a custom-fitted mouth guard when playing sports (even during practice!) to protect your own or your child’s teeth. Visit your dentist twice a year. Taking care of your teeth at home is just the first step in keeping a bright and healthy smile. Your dentist can diagnose and treat any potential problems before they become big issues. 2014 can be the year your entire family resolves to have brighter, healthier smiles. Travel size dental floss, mouth rinses, toothpastes, toothbrush and toothbrush holder (can be packaged nicely in a travel bag too! Another idea is to offer to pay for (or a portion of) a dental procedure your loved one has been putting off due to lack of funds or dental insurance. 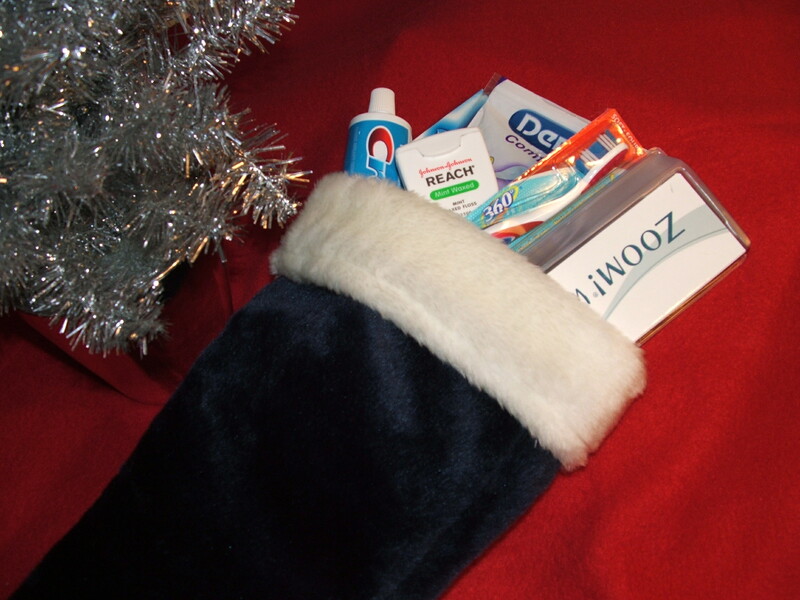 Keep a toothbrush and toothpaste in your desk, locker or lunchbox and brush after eating. Or try the single-use toothbrushes, preloaded with toothpaste (Ex: Colgate Wisps). If you are embarrassed to brush your teeth at work, try rinsing your mouth with mouthwash. Chewing sugarless gum will increase saliva production and neutralize acids in the mouth that cause tooth decay. Making smart food choices while pregnant will help in developing your baby’s dental health. Pregnant women need to be especially careful when making healthy food choices. The baby’s teeth begin to develop between the third and sixth months of pregnancy and making smart food choices will help in developing his/her dental and overall health. Children will be going back to school soon, and for parents, that means coming up with new ideas for packing school lunches. Steer clear of prepackaged foods, which are easy and convenient but full of sugar and additives that damage your child’s overall health as well as his/her dental health. Especially avoid packing lunches with foods like fruit snacks, juice boxes, and candy. These foods expose teeth to sugar, which over a long period of time leads to decay. Start the school year off right by packing nutritious lunches that will keep your child’s mouth healthy. Not only will healthier lunches help your child’s dental and overall heath, but a nutritious lunch will help them concentrate in the classroom. Share your healthy lunch ideas in the comments below. Are cold foods giving you tooth pain? Summer is here and that means sizzling temperatures and high humidity, especially in Michigan. Are your usual methods to keep cool like iced drinks, ice cream and frozen treats causing tooth pain? If so, you may have sensitive teeth. Sensitivity can be caused by tooth decay, fractured teeth, worn fillings, gum disease, worn tooth enamel or an exposed tooth root. Maintaining good oral health is the only way to prevent sensitivity. Make sure you brush twice a day, floss once a day and see your dentist twice a year.